Have the best of both worlds-use a Lee Collet Die w/ a Body (FL) Die. +1 on the Lee Collet Die. I’ve found it to be much more consistent with regards to neck tension on my 6 Dasher (at least, my S.D./E.S. numbers have gone down significantly which I attribute to more consistency). It definitely needs to be polished up out of the box, but once it’s setup, it’s exceptionally consistent. EDITOR: Jay. You got lucky. The two Lee Collet dies (.223 Rem and 6mm PPC) I’ve recently purchased and tried were downright awful. Lot of internal burrs and roughness. The mandrel was oversize so you couldn’t reduce the neck diameter enough no matter what you did. The edges of the collet fingers weren’t radiused properly so they dug into the neck. The dies could not size consistently AT ALL and the Collet fingers had bad burrs. But the worst thing was when your brass came out of the die the necks were rectangular, not round. Single worst piece of reloading equipment I’ve ever tried. In fairness I had a .30-06 Lee Collet die (older production) that worked OK on very hard Lake City brass, but the .223 Rem and 6mm PPC dies were absolute junk. I must be lucky too, the last collet die I bought was a year ago, and it was good. IMHO the Lee collet dies (w/ a little work)are excellent dies for consistent ids and concentricity. I have lapped out fl dies from Forster and RCBS that are very good, but there is nothing like squeezing the neck over a mandrel for good ids. 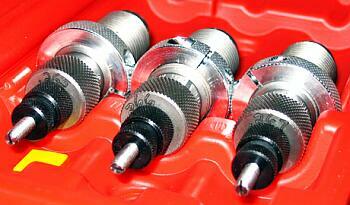 If the collet die was made by another manufacturer, slicked-up and $150 they would be more popular. I think the patent runs out next year, maybe we will see. Squeezing the neck over a mandrel for good ids, that’s ok if the mandrel is the right OD. Editor: That’s correct. If the mandrel is over-size, as was my Lee .223 Rem die, you get no sizing at all. The collet die can work, and work well — but it’s all about quality control. Good QC, good die. Bad QC, worthless die that can actually ruin your necks. Quality is everything but almost everyone that likes collet dies usually indicate that they slicked them up. I know I send Lee a couple of cases to make one for the 6.5/284 (neckturned and sized (w/ bushing dies), and fired right out of the chamber, and the die is great, then I ordered 4 extra mandrels and turned them down for different purposes and they all work great. You have to turn them the od you want for about 3/8″ and the rest of the mandrel down to the decapping pin can be smaller if you don’t use this part to expand anything. Maybe I’m wrong and if anybody disagrees they can disregard this, but it seems to me that in this accuracy game you have to modify or have modified most of the stuff (reloading tools) to achieve the accuracy we want. Dies lapped out, dies cut off the bottom, shellholders ground down, Powder Measures converted (not as much anymore), balance beam scales tuned,neck turners modified (esp mandrels), custom mandrels made for expanders, measuring devices, chambering blank dies for custom chambers, lapping bushings out for bushing dies to get that 1/2 thousandths. Quality tools improved by their own manufacturers esp ergonomics now w/ aging shooters. Adapting a dial indicator or micrometer to just about everything we use. However quality is still king because if it’s off center you can’t modify that w/o replacing or rebuilding.Someone once said “to an accuracy nut the most expensive rifle is a factory rifle because when he’s done w/ it the cost will exceed a custom”. I hope this makes sense. I guess what I’m trying to say if a person believes in the system of the Lee collet die and thinks it’s worthwhile then they could have custom mandrel(s) made up by a gunsmith or modify it themselves and polish up the collet and other parts like we do w/ other reloading tools to make them work right. It’s the only die of its kind that I know of at this time. If machining is bad then send it back to Lee for fix or replacement. Basically you’re right (imho RCBS is also in the no band-aid fix list) but the Lee collet die is the only one of a kind, and if a person believes in that system, then they will fix it or change their procedure. Not too many years ago I had a Redding fl standard sizer modified to use Wilson bushings to size the neck because Redding didn’t make bushing dies yet. Before that we used to turn down and polish exp balls for different ids and send sizing dies back to the manufacturer to be lapped out in neck area which some still do. I love Wilson seaters but there again some shooters want a custom seater made w/ the reamer that cut the chamber. But what the heck at least we have all these options today. My collet dies work great but I haven’t bought one for over a year now.